Let's travel the world! : Le Mont-Saint-Michel in Normandy, France. Le Mont-Saint-Michel is an island commune in Normandy, France. It is located about one kilometre off the country's northwestern coast, at the mouth of the Couesnon River near Avranches. The island is 100 hectares in size and has a population of 44 at 2009. 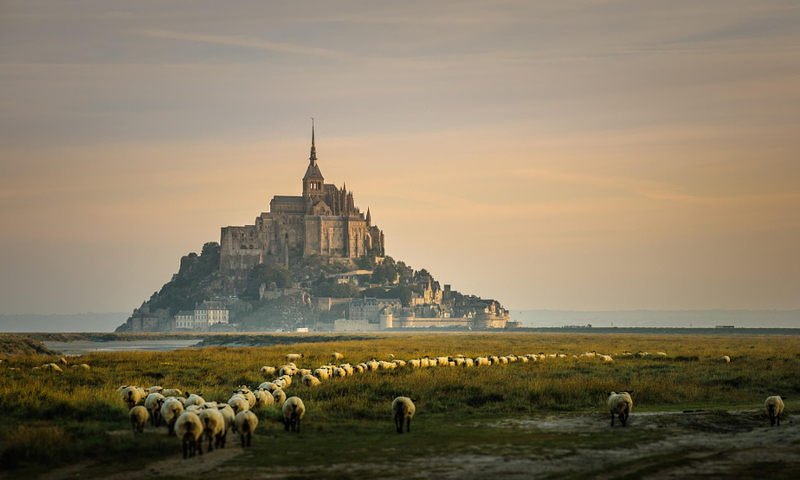 One of France's most recognizable landmarks, Mont Saint-Michel and its bay are part of the UNESCO list of World Heritage Sites and more than 3 million people visit it each year. 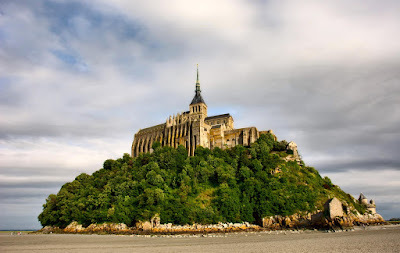 The island is best known as the site of the spectacular and well-preserved Norman Benedictine Abbey of St Michel at the peak of the rocky island, surrounded by the winding streets and convoluted architecture of the medieval town. 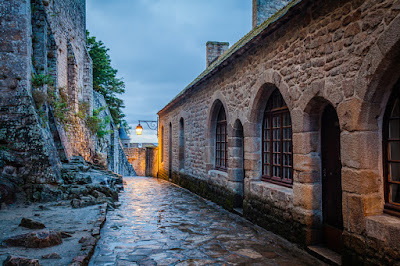 Streets of Le Mont-Saint-Michel at Night. 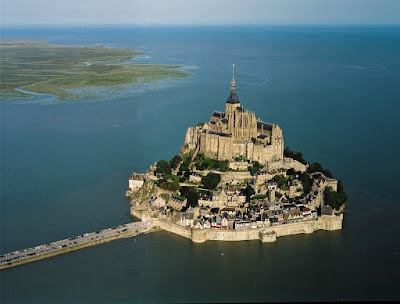 By car: Driving is probably the cheapest and easiest way of visiting Mont Saint Michel. 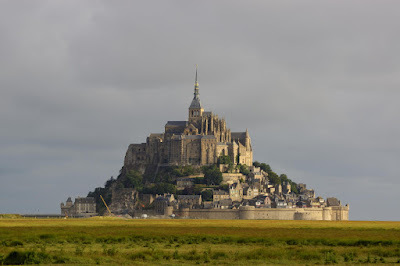 The Mont Saint Michel is a short drive from the A84 Caen-Rennes motorway. From Paris the total driving time is about 4 hours. By public transport: There are no direct train services between Paris and Mont St Michel, but it is possible to travel to Pontorson by train and then complete the last leg of the journey by bus. 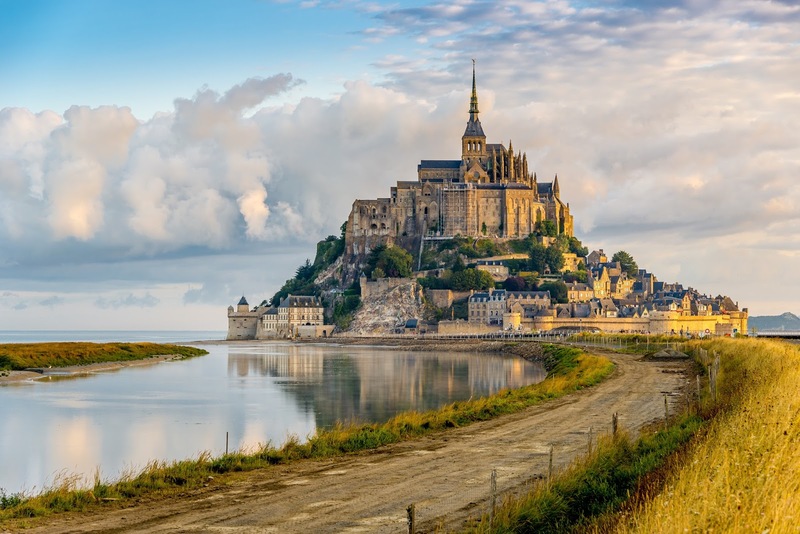 The best option is the TGV from Gare Montparnasse to Rennes, where a bus run by "Keolis Emeraude" provides a 90 minute transfer to the island. 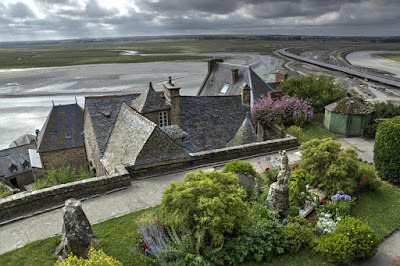 Note that the bus stops at the entrance to the Mont St Michel itself. The Pontorson train station is no more than 15 minutes from Mont St. Michel. Buses are available several times a day. 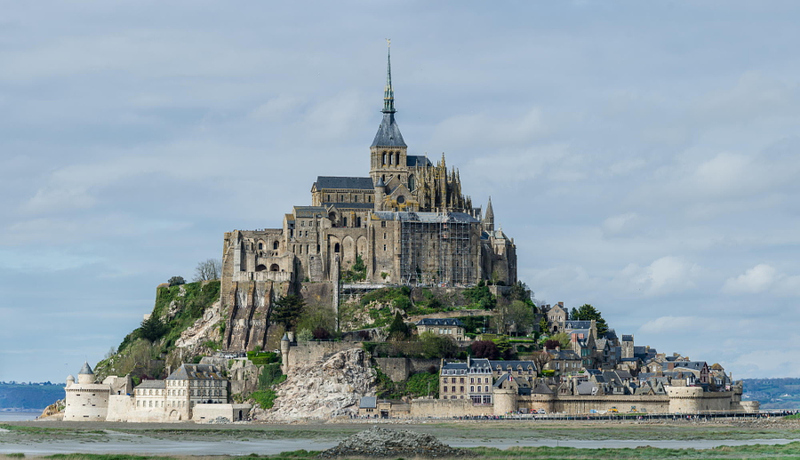 There are also two buses daily from Saint-Malo to Pontorson, which are timed to connect to buses to Mont St Michel. By bike: Parking for bicycles is free, and the ride from Pontorson to the Mount is not particularly difficult. The only way to get around Mont St Michel is on foot, and there are two gates into the walled city. The Porte de l'Avancée, the main gate at the end of the causeway, leads straight to the Grande Rue, which is packed chock-a-block with souvenir shops and tourists. All routes converge at the Abbey on top of the island. 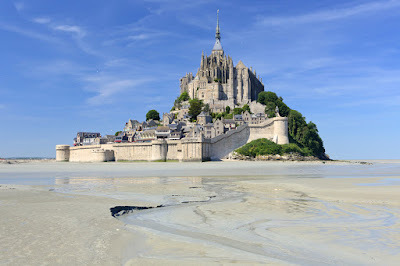 Le Mont Saint Michel with low tide in Normandy, France. Le Mont Saint Michel in Normandy, France. Abbey of Mont Saint Michel: Open 2 May - 30 August: 9am-7pm and 1 September - 30 April: 9:30am-6pm. Closed 1 January, 1 May and 25 December. 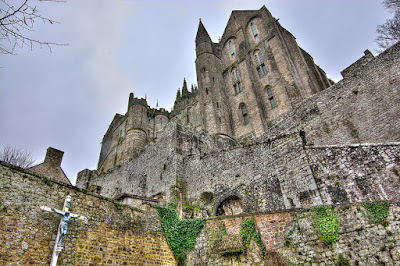 During the French Revolution, the abbey was used as a prison, and an extensive restoration was required to restore it. A few prison-era showpieces, like the human hamster wheel used to lift supplies in and out of the complex, have been kept. Notre-Dame Sous Terre Chapel: The Carolingian church named Chapelle Notre-Dame-sous-Terre (Our Lady underground) was built around 966 by the first Benedictine monks at the very place of the oratory erected by Saint-Aubert in the early VIII th century. The tidal mudflats surrounding the island contain areas of deep mud and quicksand. Visitors to the island are advised not to attempt crossing the flats by foot. The tide here is one of the fastest-rising in Europe, and as such you should never attempt any walks on the sands without checking the tide tables. It is also advisable to only attempt the crossing with a qualified guide. The Mount has several steep staircases, sheer drops, and uneven ground. Keep your children under close watch and ensure that you pay due attention at all times. 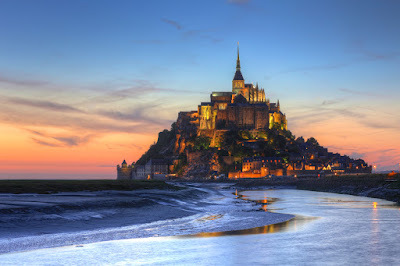 Abbey of Le Mont Saint-Michel. 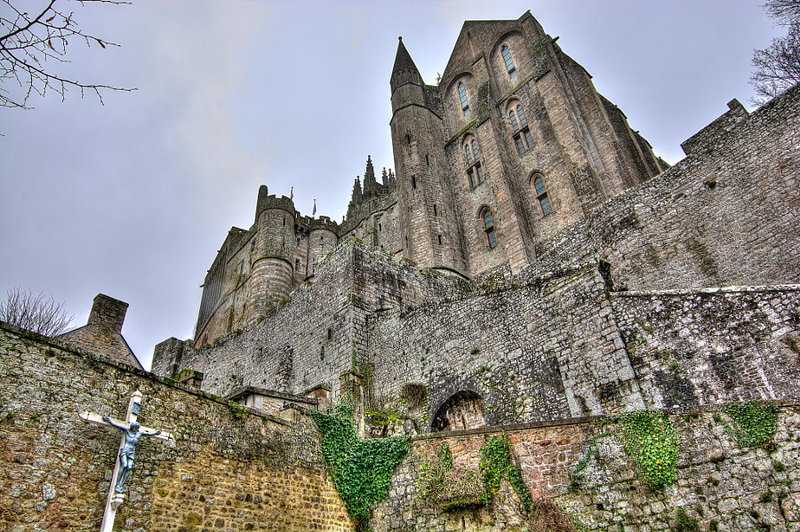 Abbey of Mont Saint-Michel from the stairs. 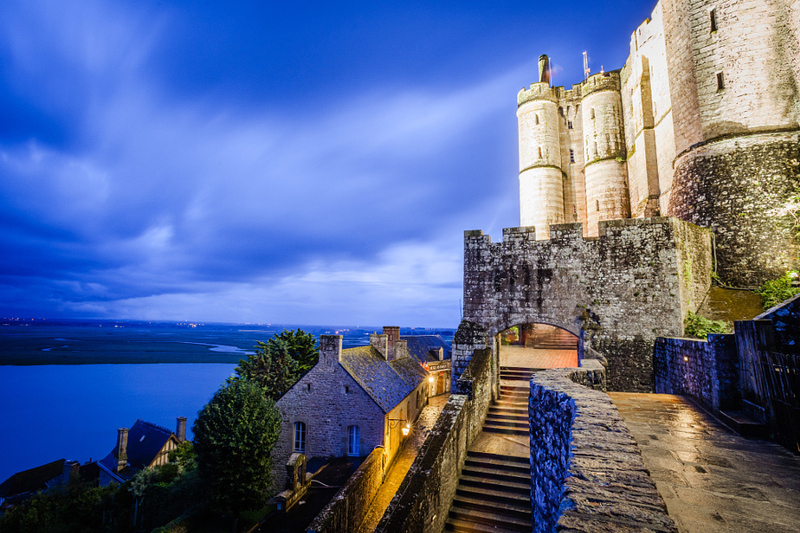 Sunrise at Mont St Michel, France.